Yippee!!! Glad to hear you have a healthy hive again. 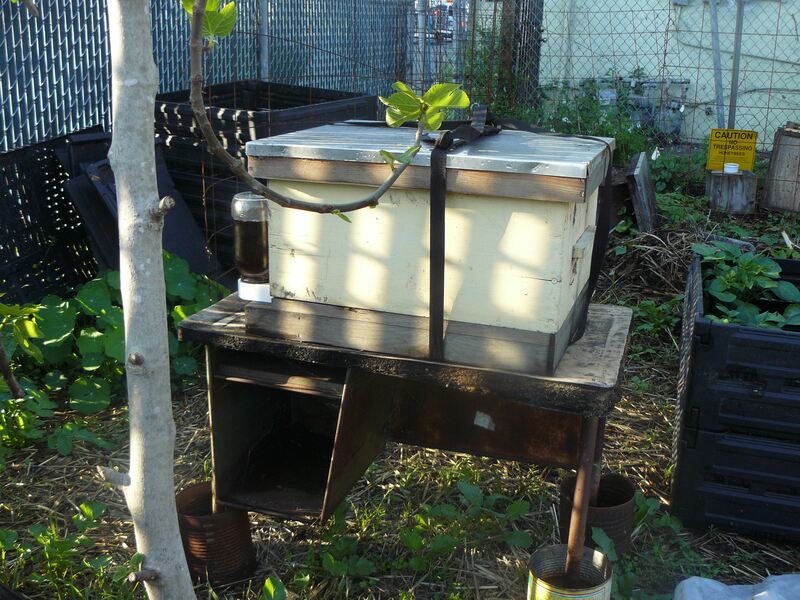 I’ve captured 2 swarms in the last month and started 2 new hives. It’s fun and rewarding to do it yourself. The coolest part was a friend was coming over when I caught the last one. She was able to photograph the whole process for me, from placing the ladder to trimming the surrounding branches, boxing the bees, and then finally installing them in their new home. Here’s to a happy honey harvest in the fall – let the pollen bloom and the nectar flow! Thrilled to hear you’re re-beed, and thrilled that I’m coming to hear you speak on the 28th! Yay bees!I installed my first hive two weeks ago, but I bought mine, because I couldn’t wait. I have new beekeeper’s nerves, though. Congratulations on getting new bees! Yay for the bees. I finally finished reading your whole blog, back to front. Our little town farm – four hens, two Pekin ducklings, and five bantam chicks (and a dog and three cats and two budgies) – is wanting some goats! Fortunately, a young friend just got four – I’m hoping to co-op with him! Gardening-wise, things are slow – we have two Black Walnuts in our yard, and they have to come down, but it’s expensive. So in the meantime, raised beds, and gardening along the side of the yard and away from the drip lines are what we have to do. Here’s to the honey bees, long may pollinate and prosper. long may they pollinate and prosper! Congrats on the new bees. I am sad to say that we lost our hive this winter too. Let me know if you hear of anymore swarms in our area! I am looking to re-establish our hive too. I’m surprised I don’t hear more about top-bar beekeeping from the avant garde. Apparently it’s nothing less than THE fix for CCD. Bees had to be pushed back a year on our new homestead, but I’m excited to get going! Check out PJ Chandler’s book “The Barefoot Beekeeper,” or his website http://www.biobees.com, in your copious free time! This is where sustainable beekeeping is headed in my opinion. Is it the cold and wet that explains the bee disappearance? I’m not a bee keeper and won’t be, but I do cherish my stand of Phacelia tanacetaflolia and the hummmmmmmm in my back yard from all the bees that cherish it on a sunny day. But this year, no. Very little action although the Phacelia beckons wantonly. Fingers crossed that Oakland will follow suit soon. Glad to hear you are back in the bee business!! Gotta be good for keeping spirits up. Thanks for keeping us posted too, always makes me happy when you post. Unrelated question: How is your Swiss Chard doing this Spring? Novella, are you seeing the same thing on your Chard in Oakland and, if so, do you have any suggestions? i have a few chard plants that are being eaten by aphids, but their favorite is the fava beans. i just let them have what they want, and plant more than i need. i’ve noticed tons of lady bugs coming to eat the aphids, but i don’t think they can eat ’em all. devora: yup, m from obugs. he’s rad! topbar fella: i keep meaning to try top bar–have fun! I caught a swarm a little over a week ago! My first. I’m so stoked about it. I put them in a TBH that we made that day, and they seem to be going strong. My year old Lang seems to be less lively. I’m waiting for steady sun so that I can give it the once over. I hope it hasn’t swarmed. Aphids are getting at my favas too. And other than some tomato seedlings from friends and the farmer’s market,the rest of my crops have yet to make it out of the seed packet. This weather is making me crazy. Got a random question that I need help with. I want to start learning about biodiesel and the steps to take to make it at home. I just checked out the public library and their resources, and of course, there is an abundant wealth of information out there. Novella, or anybody else who knows something about this, can you recommend a good book to start with that was helpful to you. Thanks guys! Loved hearing you speak last night. You are such an inspiration as I embark on my suburban farming venture. Right now I just have plants and 4 month- old chicks, but bees and goats are next. I was excited to hear you mention your Nigerian Dwarf goats- that’s what I’ve decided on. Oh, and you also inspired me to recycle my neighbors big planting pots that she had out for the garbage. They’ll be perfect for my greenhouse tomatoes! I wanted to stop yesterday afternoon but my 12 yr old daughter was horrified at the thought. Good luck with your new bees, we just got some more this year after one of our hives failed. It’s always good to know a few bee keepers out there, then you can ask for their extra colonies. Our friends use that lemon grass extract to attract the swarms into traps, you might want to keep that in mind if your hive ever divides. I don’t know what it is exactly that the bees find desireable but it works.